Suitable for Key Stage 2 pupils this programme focuses on a timetable typical of the Victorian period from 1890 for children aged from 7 to 14. 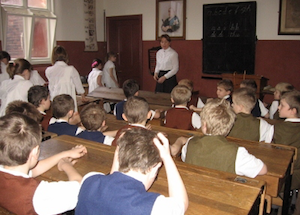 It takes place in a restored Victorian classroom with all children and teachers dressing in Victorian costume. Please note price changes as from 1st January 2014 There is a booking fee of £3.50 per child with a minimum charge of £60. or £3 per pupil when two sessions are booked as part of a whole-day visit. Maximum group size 35 It lasts one hour forty five minutes and run from 10.00am and 1.00pm (with some flexibility) Pre-visits are encouraged to discuss the learning programmes and arrangements for a school visit. These can be scheduled at the end of a school day – please call us to make arrangements.